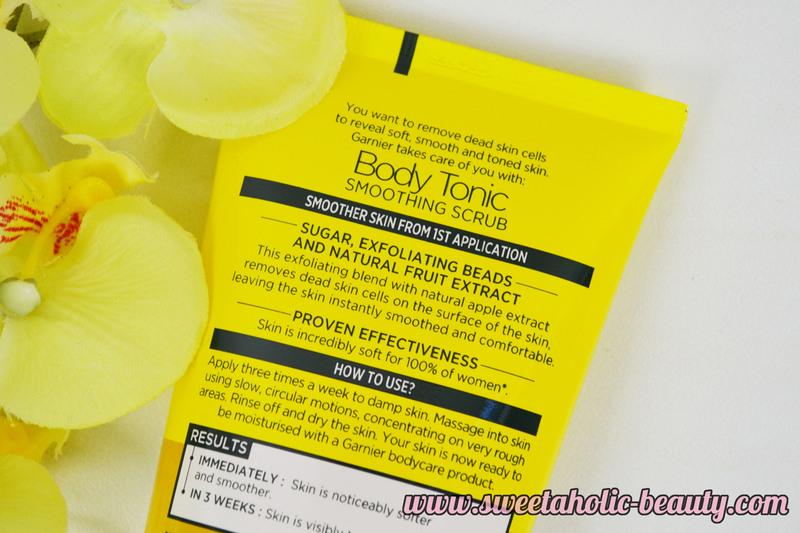 As a teenager, I was absolutely obsessed with the Garnier Body Tonic Smoothing Scrub. As I got older, I started trying out new things and forgot all about this scrub. Nostalgia hit when I saw it on sale recently, and I just had to pick it up. Back then I'm almost certain it had a different name, but upon using it again I can tell you the results have certainly not changed. One thing that first drew me to this product as a teenager was the design. I love the bright yellow packaging. When I smelt it, I was instantly hit with a wave of citrus - the good kind, don't worry. I would recommend giving it a miss if you're not a fan of citrus scents though. 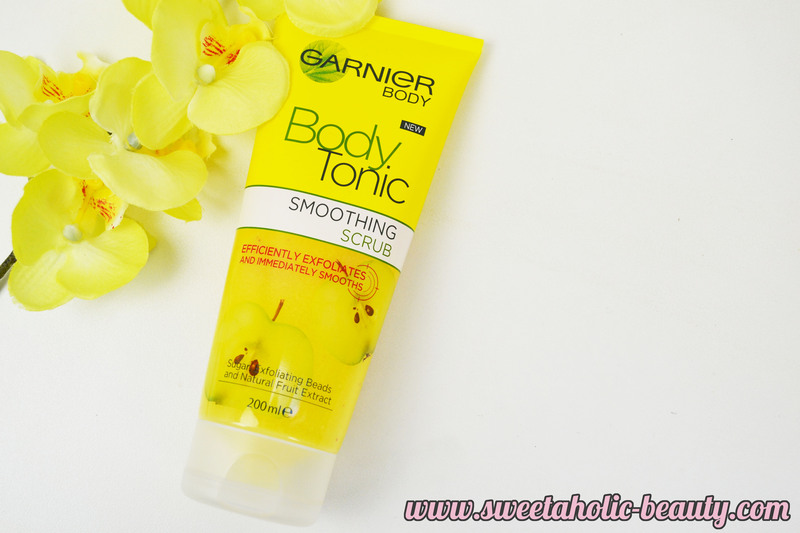 Garnier boasts that it's Body Tonic Smoothing Scrub will efficiently exfoliate and immediately smooth your skin. Containing sugar, exfoliating beads and natural fruit extract, Garnier promises this will remove dead skin cells and leave your skin feeling instantly smoothed and comfortable. Sounds pretty good to me. But what sold me on this was the proven effectiveness statistics. 100% of women that tested this out agreed that their skin was incredibly soft after use. That's pretty amazing. The scrub itself is scrubby yet gentle; the perfect balance between the two. Although it does get into your skin to really exfoliate, because it's a sugar based scrub, it doesn't sting or aggravate your skin like some salt based scrubs can. This means it's perfect for my sensitive skin. This scrub also lathers up a little bit, but doesn't leave my skin feeling dry afterwards. The main reason I used this as a teenager though - it makes my skin so damn smooth. I like to use this after shaving my legs to help avoid ingrown hairs. My legs feel like silk after using the Garnier Body Tonic Smoothing Scrub - I can't express that enough. After spending so many years using other scrubs and experimenting, I have to say I think my teenage self had it right when she picked this one first. Now that my love of the Garnier Body Tonic Smoothing Scrub has been rekindled, I imagine you'll be seeing this in my Empties posts more often! This comes in under $15 and is often on sale for under $10. If you haven't tried this scrub, I would highly recommend it! 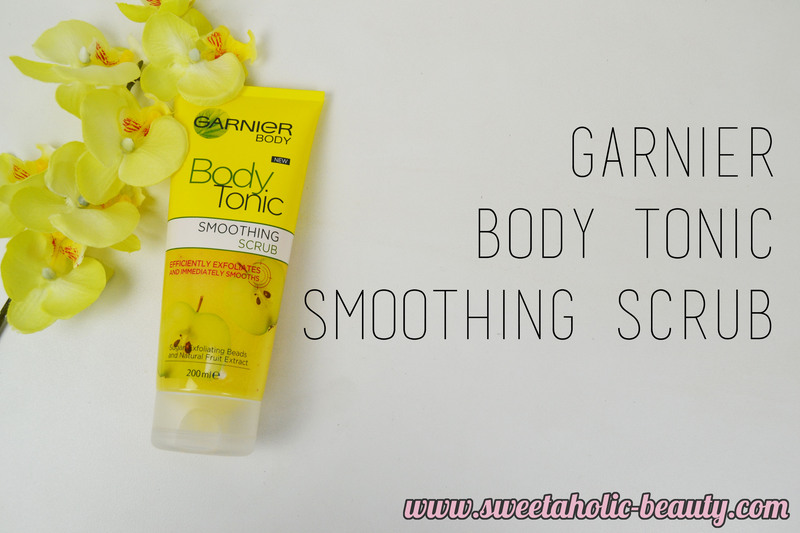 Have you tried the Garnier Body Tonic Smoothing Scrub before? If so, what are your thoughts? What is your Holy Grail scrub? I love that Garnier does a body scrub. I've gotten into body scrubs so much more in the last couple of years, and this sounds like something I've love to try! Sounds interesting! I've never used a body scrub before!